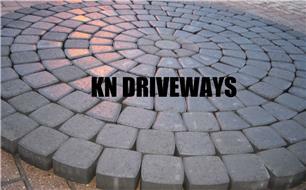 KN Driveways - Driveways/Patios/Paths, Fencing/Gates based in Kirkthorpe, West Yorkshire. The Professional Groundwork' s Company. We are a family run business that can cater for everyone's needs & requirements. We have a proven track record of excellent workmanship and attention to detail that not only meets but exceeds the clients expectations at competitive prices. We cover all aspects of groundwork' s from a small domestic garden to large commercial plots. From paths & driveways to landscaping, fencing & drainage plus much more. Covering all of North, East, South and West Yorkshire including Leeds, York, Wakefield, Selby, Barnsley, Doncaster. We do free written insurance quotes for anything from flood damage to vandalism. If you have had an accident & your insurance company wants a quote & work carried out we can help.